In this 2015th edition of February, we bring you two amazing brands catering to your beauty and home décor needs. Presenting to you our Launchpad brands ‘SoulTree’ & ‘Per Inch Design Studio’. 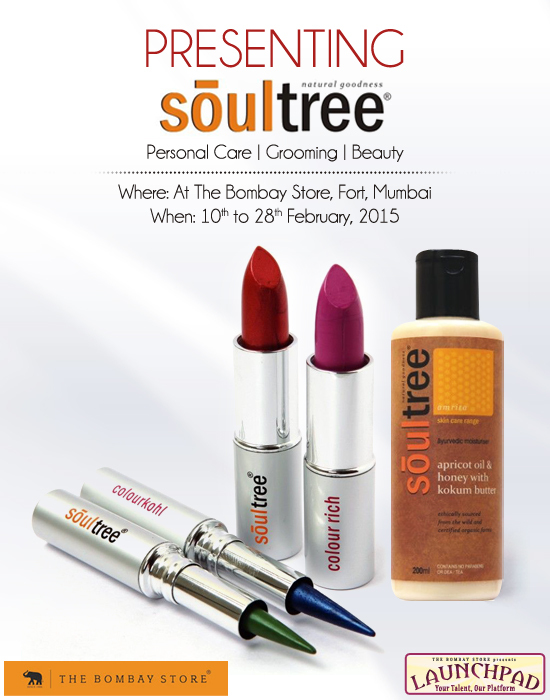 SoulTree is the home to certified natural beauty and cosmetic products. As the name suggests, SoulTree offers products made from the harmonious relationship of give and take between nature and man. Ananda – The fragrant bath care range. Keshava – The lustrous hair care range. Amrita – The protective skin care range. Mohini – The beauty and grooming range. Per Inch Design was started in 2009 with the mission to create design oriented cushion covers. They offer a chic line of soft furnishing & lifestyle products, exhibiting tremendous creativity and passion. Their product range which includes handbags, mugs & cushion covers with elegant designs & classy patterns is sure to add an element of style & glamour to your décor. You can drop by at The Bombay Store, Fort, Mumbai; to witness this eclectic collection by our Launchpad brands till 28th February. So come and visit us soon!